The degree to which we have come into a true knowledge of God is directly related to the measure of our own awareness of sin. There is no true repentance, and thus no true salvational experience in the delivering sense, until the hideousness of our own sin has flashed before our souls, and the radical requirement of Jesus’ crucifixion comes into view. A great number of Church-going people in our nation have never come to this place, for the most popular message of modern preaching has been totally devoid of this reality. It’s no wonder, since a man cannot rightly call others to this place unless he himself has passed through the press and crisis of conviction and come into the personal event of receiving mercy. We have heard more about the Gospel than any other generation, and yet scarce few have come into the inward-transaction of the Gospel in the way that David the Psalmist did. It had everything to do with his own knowledge of God as He is, and the corresponding awareness that his sin was not merely a mishap or an accident to be swept under the rug, but a heinous crime committed straightforwardly against the Lord of glory. This acute knowledge of the sinfulness of sin revealed that even though he was the great psalmist of the Holy City, his heart still had the propensity to despise the One to whom he sang. “Against You, and You only,” was David’s true lament. Our problem is that we do not know the “You.” We have an inward image of a lesser God who is not as requiring. David’s sin was all the more grievous because his knowledge of God was so much deeper. If we are inwardly winking at sin, and have grown numb to its hideous nature, it is only because we have had an inadequate revelation of God. If we are self-righteous, and thinking too highly of ourselves without being continually aware of our own propensity for sin, we have fallen just as short of the glory of God. 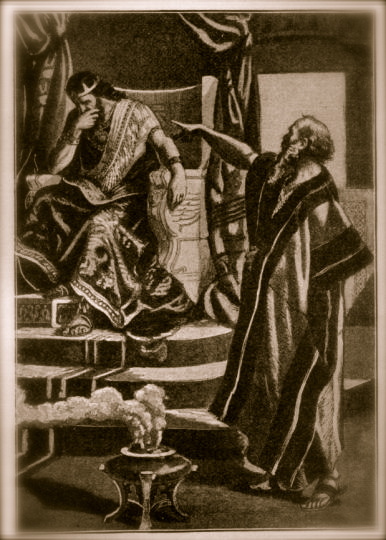 Even the anointed King and Psalmist could not play the game of reputation once his sin was disclosed. He did not shift blame or water down the hideousness of his crime. He saw himself as facing the high courts of heaven, and his transgression was not merely against men, angels, saints of old, or the heavenly creatures surrounding the Throne of God. His offense was acutely and directly against the Lord Himself, and he knew that this kind of ultimate confession and repentance was the only gateway to cleansing and redemption. We need, like David, to come into an awareness of the depth of our own sin. We need to be convinced that regardless of our spiritual history, our religious heritage, and our pious consistency, we still have the propensity to sin, and our blackness of heart is no less black than David’s was. When we are made aware of our depravity, by the grace of God’s speaking, we are then standing upon the proper foundation of truth, by which we are enabled to cry out for purification and restoration. If we have yet to be brought to that place, we have not repented, nor have we been saved from the stranglehold of our sin. We do not hear sufficient prophetic preaching these days, not the kind that addresses the issue of sin, and we need desperately for that kind of proclamation to be restored. Our ministries have discouraged an adequate consideration of sin, and we have striven to extend comfort to those who have yet to come into a revelation of their own offense against God. We cannot live lives of mercy until we are actively receiving mercy, and if we have failed to cry out to the Lord over our own fallenness, we have not come to that place. We will not only cry out about a particular and embarrassing sin, but about our very tendency to stray from His ways, and when we have cried out from that sacred ground of revelation, God Himself will cleanse, restore, and deliver us to the uttermost, and we will be like Jacob- unable to walk again as we had theretofore walked- awed and jolted by the fact that we have “seen God and lived.” His mercy will be altogether merciful to our souls, and His goodness altogether good. The intimate knowledge of His mercy in light of the hideousness of our own sin is the essence of the Gospel of God. What about you, dear saint? Have you cried out from that place?